So today I had a craving and a desire to do a little experimenting. That hasn't happened in a very long time, so I thought I better jump at the chance. I'm really glad I did. These yummy beauties were definitely worth it! And it was fun to share them with some of my friends and neighbors. I wish I had enough to share with everyone! As a bonus...the peppermint is to celebrate the opening of the Christmas Season, and the pink is a little nod to the baby girl arriving at our house soon! 1. Preheat the oven to 350 degrees F. Line two 12 count muffin tins with paper liners. 2. In a large bowl combine the cream cheese, egg whites and vegetable oil. Using a hand or stand mixer, beat the ingredients until combined and creamy. 3. Add the cake mix, water and peppermint and mix until smooth, about 3 minutes. 4. Divided the batter evenly into two separate bowls. Add 1/2 cup crushed candy canes as well as the gel color to half the batter. 5. Fill the muffin cups with half white batter and half pink batter. Using a tooth pick, lightly swirl the two batters together. 6. Bake at 350 degrees for 20 - 25 minutes, or until toothpick inserted in the center comes out clean. 5. Remove from the oven, let cool slightly in the tin then transfer the cupcakes to a wire rack. 6. 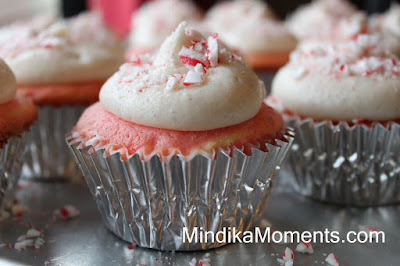 When cool, frost with vanilla bean frosting (recipe below), and sprinkle the remaining crushed candy canes on top. 1. In a mixing bowl combine the butter, vanilla bean paste and powdered sugar. Mix, starting slow, until somewhat combined. 2. Start by adding 1/4 C. milk and mix. Slowly add more milk, one or a tablespoons at a time, until the frosting reaches your desired consistency*. *For cupcakes and cake you want the frosting to be a little thicker, so it holds it's shape. If you are using the frosting recipe for cookies, Cinnamon rolls etc...you may want the frosting a little thinner. **If you've never heard of or used this amazing product, I wanted to take this opportunity to tell you all about it. Vanilla Bean Paste is one of my all time favorite discoveries in baking. It can be used in any recipe that calls for regular vanilla, but it can also be used for those more difficult recipes that call for a real vanilla bean. 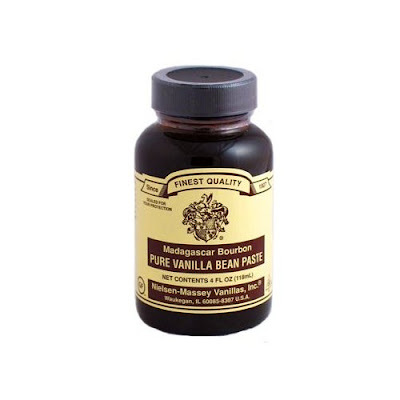 It's much cheaper than real vanilla beans and much easier to use. 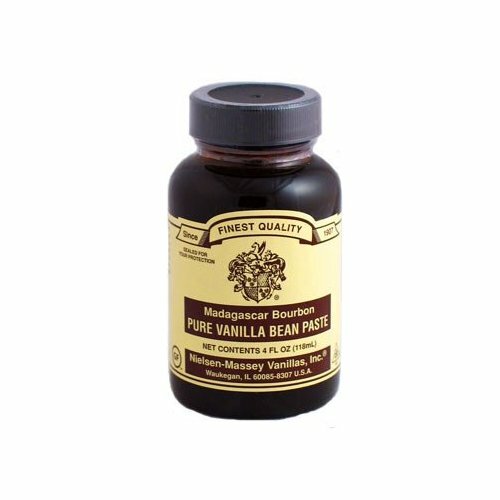 It has a stronger richer vanilla flavor, and it leaves those fun vanilla flecks through out your baked products. I've used it in ice cream, whipped cream, cakes, frosting's, sauces, cookies etc... Locally I buy mine at William Sonoma. You can also purchase it on-line. I promise it's worth it! Yippee!!!!!!!!! I'm so glad you posted these early! I OBVIOUSLY loved them. I'm so glad that I got to try them! They were delicious! I love the flavor of peppermint! Mmm. These sound grat. This looks so good. and thanks for the info on the peppermint paste. Never heard of it, now going to take a trip down the road to Williams Sonoma. Thanks! These are so pretty! I'm sure delicious too!